CyberpowerPC has just announced their latest Gamer Scorpius range which will comprise of a bunch of desktop gaming PCs that will be powered by AMDs new FX-series Bulldozer CPU series. 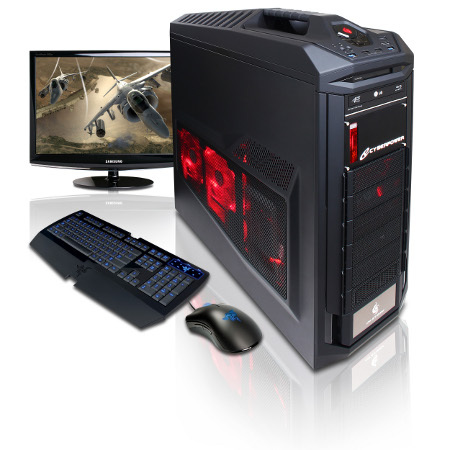 Having said that, you know that raw computing power won’t be in short supply with what CyberpowerPC has thrown into the mix, so rest easy knowing that no matter which model you decided to drop some serious coin on, it will be able to cater to your basic gaming needs without batting an eyelid. The new Gamer Scorpius series will rely on a combination of AMDs new FX CPU, Socket AM3+ (900 series chipset motherboard), and AMD Radeon HD 6000 graphics that is said to deliver more than 50% performance over the previous generation of AMD desktop platforms – all without breaking the bank. The new AMD FX CPU is capable of delivering fully unlocked processor clock multipliers so that maximum speed is achieved at most times, even when you are running on a multi-display gaming setup. All four unlocked AMD FX CPUs in its Scorpius series will be featured – where among them include the AMD FX-8150 3.60 GHz 8-Core CPU, the AMD FX-8120 3.10 GHz 8-Core CPU, the AMD FX-6100 3.30 GHz 6-Core CPU and the AMD FX-4100 3.6 GHz Quad-Core CPU. Seems to be more than enough for your alien busting needs, no? I suppose the average gamer would be more than happy with this already. Also touted to be the “worlds first native 8-core desktop CPU line”, it will feature Microsofts DirectX 11 technology that delivers an ultra-realistic gaming experience. AMDs Turbo Core and VISION Engine graphics technology come into play in order to boost CPU speeds whenever you aren’t gaming but still want to run processor intensive tasks such as making digital content. With such speed at your disposal, surely a decent cooling system will need to be in place, and CyberpowerPC does not disappoint as the Gamer Scorpius gaming PCs can be customized in a variety of channels – such as CyberpowerPCs Xtreme Hydro Liquid Cooling kit, CoolIT ECO-II liquid cooling, and Asetek 500 series liquid coolers. Prices start from $999 upwards.